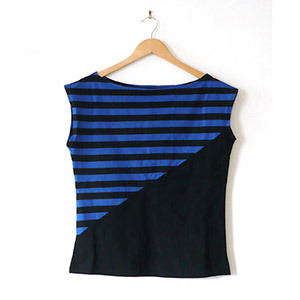 Your new favourite alternative to a t-shirt this pattern is fairly loose fitting although it is shaped in a bit at the waist so it's not completely shapeless. The vest is nice and long so you won't be flashing off your midriff and the dress works with both bare legs in summer as well as over leggings or jeans. Both options are included in the pattern as are instructions for adding extra seams so that you can combine different fabrics. It's a great project to start sewing as it's super easy if made all in one fabric and is really quick to sew. 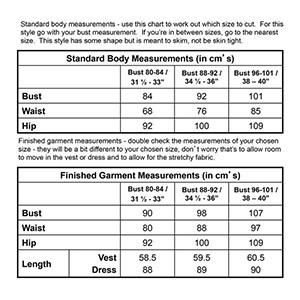 The multi-size pattern covers 3 sizes which cover the following body measurements: BUST 80-84cm (31.5"-33"), 88-92cm (34.5"-36"), 96-101cm (38"-40"). Suggested fabrics are cotton jersey, french terry, ponte de roma and cotton lycra.